Special Note: Unit #110 is directly behind THIS unit! Rent both units for special family events or get-togethers. Located at Milepost 12.8 with superb sea and Jockey's Ridge vistas. CATV, DVD, VCR. Other comforts include covered porch with furnishings, enclosed outdoor shower, outdoor space at the dune line, and swing. 30 yards to the beach. Washer and dryer shared with unit 110. Upper Level: You Enter from Deck-Covered Porch w/Furnishings, Well Equipped Kitchen, Bar at Counter w/3 Stools, Separate Dining Area in center of House, Trestle Table Seats 8, Washer and Dryer is shared w/#11, Laundry is under #110, 3 Bedrooms w/Double Beds, Loft Bedroom w/2 Double Beds, 1 Bedroom w/2 Twins, Modest Living Area furbished w/Great Old Nags Head Photos and Local Art. 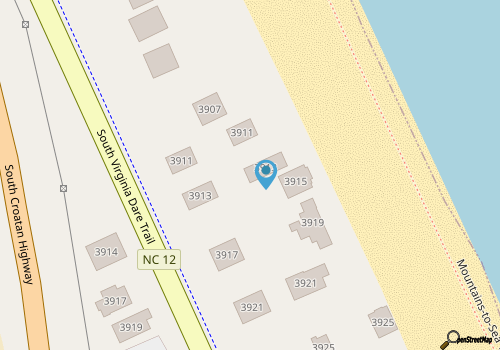 This is a great Old Nags Head Beach House, Covered Sea Front Deck w/Walkway to Dune Deck, Stairs for front home comes up the side not interfering with your privacy on your outdoor space but walkway is shared by #110, Stairs to Beach, Full Bath w/Shower on Front Porch, use House Key. Linens: 3 w/Double, 1 w/2 Doubles, 1 w/2 Twins. Guest Linen Option.